When you shoot with a zoom lens, you can change the look of an image without moving from where you are standing. That can be an advantage, but it can also be a disadvantage, because it can discourage you from exploring different angles or different perspectives. I really enjoy shooting with a lens of a fixed focal length, especially my macro lens, because it forces me to think more about composition. If I decide that I want the subject to be larger in the frame, I have to move physically closer to the subject. If the terrain doesn’t let me get any closer, then I have to consciously consider how else I could frame the shot. 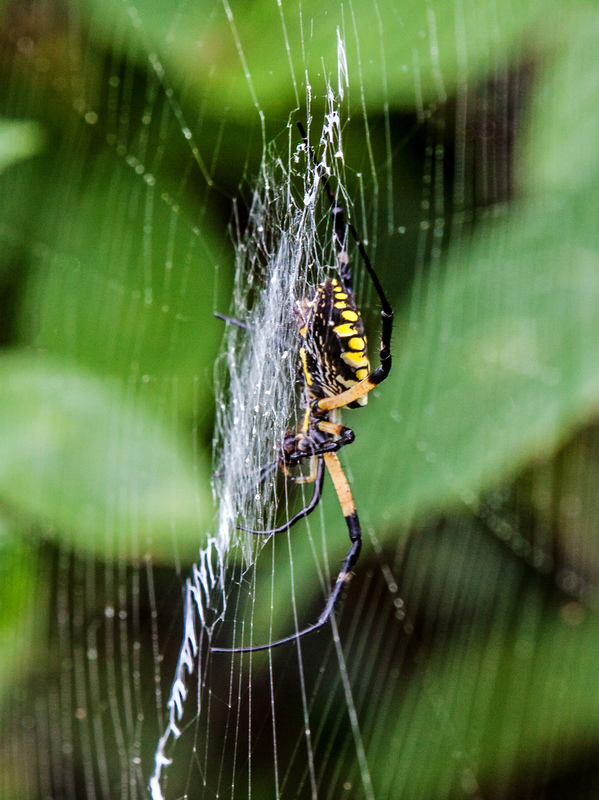 This past weekend I saw a lot of black and yellow garden spiders (Argiope aurantia) when I was exploring Jackson Miles Wetland Refuge, a small park not too far from where I live. 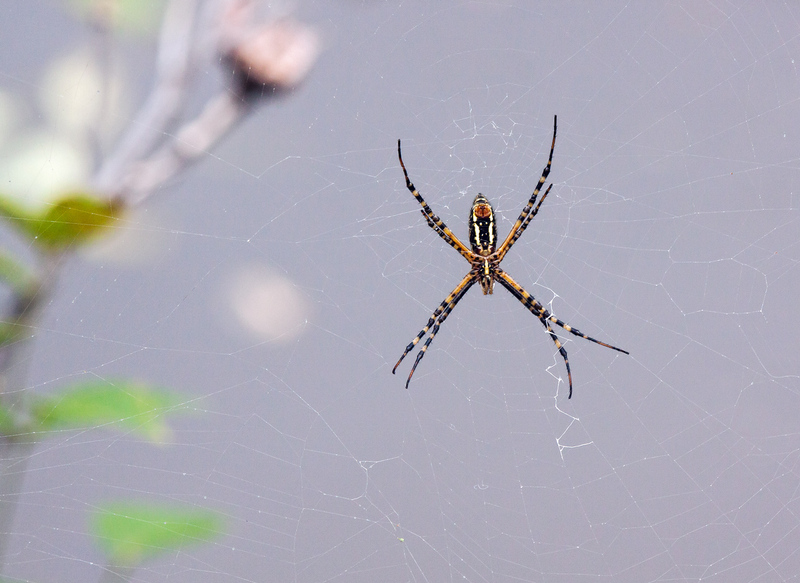 Some of the spiders were in bushes and others were overhanging the water of a small pond. It was a fun challenge to figure out how to photograph the spiders in different and interesting ways. In the first shot, I decided to shoot the spider from the side rather than from the front as I normally do. I was delighted to see the way the the shape of the vegetation in the background almost matched the shape of the spider’s legs. I also photographed the spider in the second image from the side, but the leafy backdrop and the inclusion of more of the spider’s web gives the image a completely different feel as compared to the first one. When I saw the spider in the third image overhanging the water, I loved the shape of its body and its extended legs. If I had had a zoom lens, I am pretty sure I would have zoomed in on the spider. When processing the image, I was also tempted to crop in closely. I remember when I was shooting, though, that I deliberately included the vegetation on the left hand side, because I liked the way that it looked. So the image that you see is pretty much the one that I chose when I shot it, having zoomed in as closely as my feet would allow (without getting really wet). Despite my normal desire to fill my frame with my subject, I think it was good that I was not able to do so in this case. I like the team colors, Mike – great shots! Yeah, as embarrassing as they were yesterday, born in the city, fan for life. I watched part of that game. Roethlisberger sure threw a lot of passes! Yeah. He threw too many over the receivers. We scored enough points, but the defense only played 30 minutes. Interesting and thought-provoking commentary on each shot. Very nice photos of these hard-to-photograph spiders! Thanks. I have come to enjoy expressing myself in words in my blog as much as doing so with my photos. I don’t really plan in advance how I will write my text, but will sit down with the photos, choose an approach, and just start writing. What you tend to get is a pretty accurate representation of who I am as a person. I agree–great photos enhanced by gentle descriptive insights from the photographer’s point of view: a combo that encourages me to look closer…and not only at the shots on the blog. Thanks. Nice exploration, Mike. 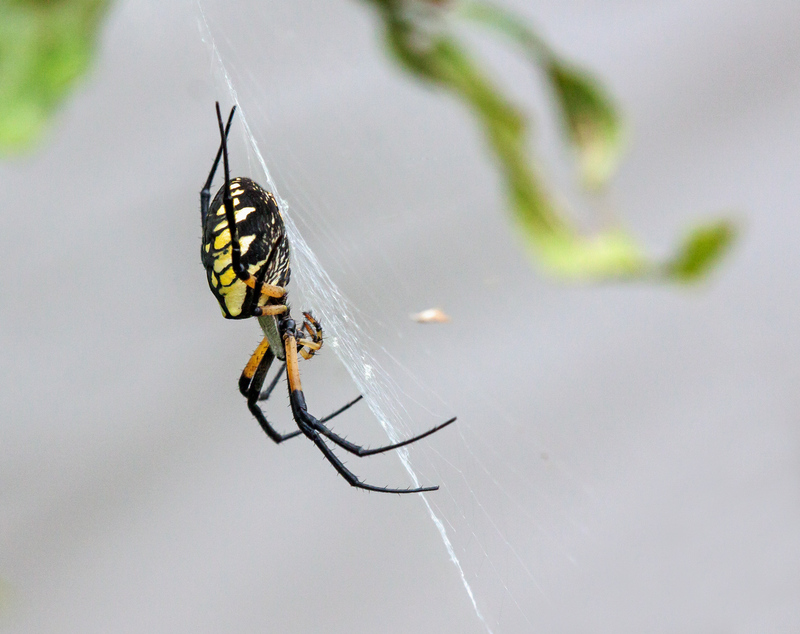 I haven’t seen any garden spiders this year, so your shots are a fine substitute. Wow, what a great blog this is! I enjoyed your photos+discussion, and I enjoyed the comment conversation too. I had to look again when you said about the shape of the vegetation matching the shape of the spiders legs – it really does! In the last photo I felt like the spider was floating gently in space, such a nice feel to this shot and I really like the lavender-blue background. It seems I’m in the mood for playing favourites because I’ll add that after looking at these, the last shot stole my heart (even though its a spider shot). I never thought I’d love a spider shot but I DO love that shot, its ADORABLE 🙂 Well done! Thanks, Liz. I enjoy receiving such detailed comments, because it allows me to see my photos through your eyes. I am pretty secure about the choices I make with my photos, but I never know for sure how others will respond. Your comments about the last image reinforce my decision to include it and to keep it “loose,” i.e. with minimal cropping.